Tiger Woods is back at the British Open for the first time since 2015 and started it off strong in the first round on Thursday. Woods’ day started with a bang scoring a birdie on the first hole. He continued strong with two more pars followed by another birdie on Hole 4 to put him at 2-under and into the top 10 where he finished at the turn. The second half gave him a bit more trouble though as Woods dropped his first bogey of the afternoon on 12. He followed it up with another birdie on 13 before finishing out the day with some tough misses for par and birdie tries and two more bogeys to his name to finish at an even 71. Woods’ 71 is his second best score at a major this year behind just his fourth round 69 at the Masters. Second putt: Ends the day with PAR. First putt: Gets it close on the birdie try but about a yard to the left. Approach: Drops it on the right side of the green and it’ll be another long birdie try. Tee shot: Last tee shot of the day gets a beauty of a roll down the fairway. Second putt: Sinks it for another PAR. First putt: Leaves the birdie try about a yard shy. Approach: Puts it on the green about pin high and roughly five yards out for birdie. Tee shot: Iron off the tee and right down the center of the fairway. Second putt: Taps it in for PAR. First putt: Gets it close but it rolls past the hole. About two yards out here. Tee shot: Tee shot is off the green to the right into some short rough. Second putt: Sinks it for his third BOGEY and he’s back to even now. First putt: Gets it to about a yard out. Approach: Runs it to the middle of the green. It’ll be a tough go for par. Chip: Gets it out onto the fairway with still a ways to go. Tee shot: Iron shot gets good distance but rolls into the bunker on the right. First putt: Gets it close for what should be an easy tap in. Chip: Good shot to get out of there. Looking like a two-putt for par though. Approach: Drops his second iron shot into the bunker. Tee shot: Interestingly goes with an iron on the par 5 but gets some good distance down the right side of the fairway. Second putt: Ouch. The par putt rims out. Tough break there. First putt: Comes up short on the birdie try there with a yard to go. Tee shot: Drops it nicely onto the green about 12 yards out. Chip: Chips it to about a foot from the hole for an easy par. Approach: Gets the distance but it keeps rolling and rolling off the back of the green. Tee shot: Iron off the tee again and down the middle of the fairway. Still about 240 yards to the hole though. First putt: Twelve yards out and he nails it for his third BIRDIE. Right back to 2-under on the day. Approach: Lands the approach on the green but it looks like it’ll be a two-putt from here. Tee shot: Great distance off the tee and it lands right down the middle of the fairway about 240 yards. Second putt: Taps it in for his first BOGEY of the day. First putt: Bad miss left on the par putt. Approach: Drops it nicely on the green. About seven yards out from there for par. Chip: Had to go sideways to get out of the bunker and onto the fairway. Tee shot: Tiger goes with a 3-wood this time and it goes right and into a bunker. First putt: Sinks it with a fist pump for PAR and heads to the back nine at 2-under. Chip: Pops it out of the bunker nicely. About three yards to save for par. Approach: It’s short and right on the approach and rolls into the bunker. Tee shot: Another tee shot with the iron and this one goes just off the fairway to the right. First putt: Tiger gets a good roll but it goes just about a yard past the hole. Tee shot: Iron shot bounces safely onto the green. Would be a very long birdie putt from there. Second putt: Taps it in for another PAR. First putt: Just short of another long birdie putt. Approach: Solid approach drops on the green to the left of the pin. About eight yards out. Tee shot: Another iron off the tee and another shot right down the fairway. Good spot. First putt: Misses the birdie putt just right, tough miss. Chip: Hits a good one out of the bunker and has another short birdie try ahead, about two yards out. Approach: It drops short and to the left of the green and rolls right into the bunker there. Tee shot: Goes with the driver for the first time today and booms it 365 yards with a friendly roll too. 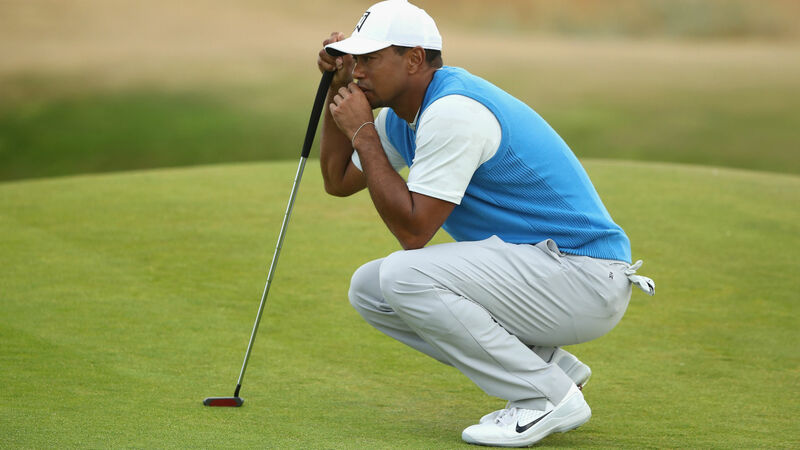 First putt: Tiger nearly converts on the long birdie putt that stops at the lip of the cup. What a putt that was. Approach: Drops it on the right edge of the green about pin high. He wasn’t happy with it but not a bad spot to be. Tee shot: Down the middle of the fairway with the iron, decent distance again. First putt: Got it. That’s BIRDIE number two for Tiger on the day. Approach: He’ll take that one. Tiger drops the approach just about two yards from the hole. Big birdie try coming up. Tee shot: Solid shot off the tee goes to the left edge of the fairway but gets a friendly roll off the banking. About 160 yards to the hole. Second putt: Another tap in for PAR. First putt: Long try but misses the birdie putt to the left. Approach: A little long but it stops on the back edge of the green. Tee shot: Goes with an iron off the tee and lands it on the right edge of the fairway. About 150 yards to the hole. Second putt: Easy tap in for PAR .